Each year the folks at FireEye release the M-Trends report compiled by their Mandiant Consulting arm. This outlines what last year’s IT security trends were and what we should anticipate in the coming year. While this year’s M-Trends 2016 validates what many of us have experienced firsthand, it really brings to the forefront how critically important securing identity will be this year. Within the 48-page report, there are 21 sections directly related to identity. Not to mention, a few infographics that invoke identity questions. After taking out the filler pages, identity is mentioned in almost every page. It will be a safe to say that Compromised Identity is the single largest issue allowing hackers to successfully execute their attacks; this was the case in 2014, again in 2015 and certainly will be the theme of 2016. 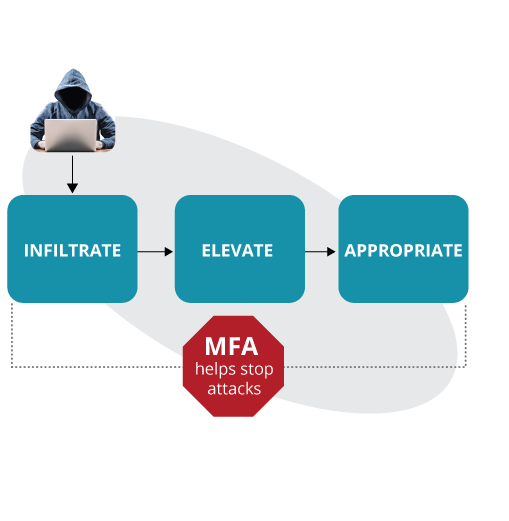 Attacks are becoming disruptive — These are no longer behind-the-scenes attacks, as hackers are looking for ransoms, and they they will embarrass your company if you do not give in. Attacks are targeted at personally identifiable information (PII) — Hackers are going for specifics to really target users. Attacks are aimed at network devices — By changing flows of information and the ways to access networks, hackers have free reign. Outsourced Service Provider Abuse — This is a case of breaching those outside of your organization with access to your organization. Windows Persistence — There are all sorts of windows services that are ripe for hackers to abuse. Vulnerability Assessments — Not a new concept by any means, but has never been more important. Credentials — It is necessary to make it difficult for unauthorized users to gain access to your systems. Inability to detect a breach — If you aren’t monitoring systems and access, you don’t know if you are protecting yourself. Poor Egress Controls — You need to keep bad guys from getting in, but it is also important to keep bad guys from getting out of your network. Use the information you have captured to make decisions. When an attack appears — verify and respond. For the remainder of this article, I would like to focus on addressing the 21 sections that relate to identity security. Centrify helps IT security teams that are struggling to prevent data breaches in our cloud and mobile world. Compromised identity is the leading cause of security breaches (nicely outlined in the M-Trends 2016 Report), but traditional perimeter defenses cannot protect users with too many passwords, too much access and too much privilege. Centrify helps customers solve these problems and establish a new perimeter — based on identity. This reduces risk and simplifies administration. Below is how I would use Centrify products to address the mentioned security concerns. I’ve included a clip from the M-Trends report with the page number for reference along with my brief interpretation. Most of my recommendations aren’t particularly complicated but like most things in life, it is the little things that count. At face value, I would look at this as being initially prevented with the use of multi-factor authentication (MFA). This quickly turns to a conversation about enforcing least privilege access, not to mention the need for workflow (Centrify Identity Service, Privilege Service or Server Suite). With multi-factor authentication installed it would be hard for someone remotely to do this, and with the enforcement of least privilege, very few accounts would have this level of access (Centrify Server Suite). Implement multi-factor authentication for access to the backup system and if it has share accounts make sure a password safe is implemented (Centrify Privilege Service). Have strong password policies, change them frequently, use a single identity store, use SAML authentication where possible and lock it down with multi-factor authentication. Needless to say, hackers are aware that focusing on compromising identities is where they gain the greatest value (Centrify Identity Service). Enforce least privilege access to make this very difficult and implement multi-factor authentication so you know who is accessing Active Directory (AD) (Centrify Server Suite). Maintain a single identity store, have strong password policies and implement multi-factor authentication. Hackers are looking to compromise identity so they can escalate privilege (Centrify Identity Service). Implement server isolations so only trusted servers or computers can talk to each other (Centrify Server Suite). Networking devices historically use shared accounts and are rarely updated. Implement a password safe where admins log in using their Active Directory credentials and have no knowledge of what a device’s password is (Centrify Privilege Service). Multi-factor authentication would certainly help in this instance, and protection of shared accounts in a password safe would go a long way (Centrify Identity Service and/or Privilege Service). This recommendation is pretty clear: Use multi-factor authentication. (Centrify Privilege Service). Control the service providers that are accessing your network and only allow them to access the specific applications or devices they are hired to manage – not the entire network. This cannot be overlooked (Centrify Privilege Service). Don’t give your outsourced service provider a site-to-site tunnel. Only give them access to the application or device they need. Make them use multi-factor authentication (Centrify Privilege Service). “Outsourced service provider abuse was observed in several forms throughout 2015. We investigated cases involving financially motivated attackers leveraging stolen credentials from third-party service providers to access retail and hospitality networks and steal payment card data, a continuing trend that has been widely reported over the last few years and has not shown any signs of decreasing. Implement multi-factor authentication and have a single identity silo that uses strong password policies. Consider providing role-based access by granting a level of trust to the service provider’s Active Directory (Centrify Privilege Service, Identity Service). Enforce least privilege access on the management server. Only give the ITO the minimum level of access to do their job. Multi-factor authentication would also help (Centrify Server Suite). Don’t give unrestricted access by implementing least privilege access on the server. Instead, only give access to the server and not to the network. Then, secure that access with multi-factor authentication (Centrify Server Suite, Privilege Service). “Historically, large enterprises have been wary about migrating their IT infrastructure to the public cloud because of perceived security risks. As we’re seeing in our investigations, the risks associated with outsourcing IT services may be just as concerning. Consider the following recommendations if you are engaging, or have already engaged, an outsourced IT service provider. Implement multi-factor authentication mechanisms for all outsourced service providers and, where possible, via jump server for service providers to access a client network environment. If an attacker is active inside an outsourced service provider’s network, multi-factor authentication with a dedicated jump server can prevent them from being able to steal credentials and pivot directly into the end-client’s (victim) networks. Furthermore, any chosen multi-factor solution should be tied to a corresponding user’s Active Directory account and not be valid for other accounts. Hardware-based tokens or phone-based tokens (such as those delivered via SMS) are more secure options for multi-factor authentication. Be sure to actively monitor remote logons for any suspicious activity. Implement multi-factor authentication, only provide access to the server requiring access, enforce least privilege access and produce log files. Log files that can be tied to an identity can greatly help enrich the correlation of a SIEM solution (Centrify Server Suite, Privilege Service). If you want to stop the abuse of windows servers, a great first step is to enforce least privilege access. Don’t give Windows admins full administrator rights to all windows servers if they don’t actually need it (Centrify Server Suite). “The following observations are not intended to be an exhaustive compilation or ‘Top X’ listing of the security vulnerabilities that continue to plague enterprises. As with every security firm and internal testing team, we continue to encounter default credentials, missing patches, poor input validation, outdated operating systems and other common issues showing up on vulnerability reports everywhere. Rather, these observations represent a common set of key issues identified during targeted testing in which the target organization is unaware of the test (except for a small set of stakeholders), and our testers have “carte blanche” to attack the organization using the same TTPs of an advanced adversary. Many organizations still have not fixed the password problem. In short, many organizations still struggle with forcing users to use passwords that are sufficiently complex and difficult to guess. There is plenty of research and statistics available on passwords 6, and the issues specific to user password management have been acknowledged for a very long time. Modern enterprises have access to a variety of robust solutions that address the problem with credentials, from password vaults to multi-factor authentication to single sign on. Yet passwords remain a systemic problem for almost every client we encounter, so we cannot discuss attacking without talking about passwords. This issue is not just limited to the regular user population. Sysadmins, developers, DBAs, domain administrators, and even security professionals continue to present a huge risk to their own enterprises. These users – who should know better and are highly targeted – remain some of the worst offenders for choosing poor passwords or disregarding established policy. If you are on an IT or security team, know this: The bad guys are coming for you and they want your credentials. Do not make it easy by having a poor password policy. Cached credentials remain a major issue. In addition to the well-known password dumping tools already available, the weaponization of PowerShell and WMI has resulted in multiple effective toolkits that make targeting “high value” users and extracting credentials from memory almost trivial. These tools are fast, almost impossible to detect by AV, publicly-available, and widely supported. Even with detailed guidance from Microsoft regarding the protection of credentials and the built-in safeguards in modern Windows operating systems, our Red Teams continue to have extraordinary success retrieving credentials from memory and reusing those credentials to move laterally throughout a network. This is exactly what Centrify does: Uses a single identity store so that all users (admins or business users) can log in as himself or herself, implements single sign-on across all systems and executes multi-factor authentication across all important systems. Don’t ever share passwords (Centrify Server Suite, Privilege Service, Identity Service). Using a single identity store with password safes and multi-factor authentication will provide enriched logs to allow for better monitoring will go a long way. Also, add least privilege access enforcement to increase server security. Privilege accounts and users hold the keys to the kingdom, so secure them like they hold the keys to the kingdom (Centrify Server Suite, Privilege Service). Implementing Identity Security is a mature practice in the enterprise and is quickly filtering down to the mid-market and SMB space. Security affects everyone (Centrify). “During the widespread zero-day exploit use by APT3 and APT18, two other significant intrusions occurred. The first involved APT29 – a suspected Russian origin threat group – compromising an entity actively involved in Russian oil interests. APT29 conducted numerous RDP sessions disguised as valid normal SSL connections inside this client. The RDP sessions were used to place malicious code within the firm, as well as steal multiple files. With a greater focus on identity security along with properly implemented controls like multi-factor authentication, least privilege and strong password policies, this may have never happened (Centrify). While there are many ways to approach any problem, I hope that I have shown a holistic way to address some very complex problems with a great identity platform. I’m sure 2016 will throw even more challenges our way, but it is key to get basic security controls in place if you are to stand a chance of protecting your organization. Multi-factor authentication, least privilege access, single source of identity and strong password policies should be in every organization’s plans and Centrify is perfectly suited to help. To learn first-hand how Centrify can address the issues discussed above, sign-up for our 30-day free trail here.